David Hunwick founded the Sculpture Studio in Victoria in 2008. Forbidden Fruit, bronze, 2009. Sculpture Garden, Horticultural Centre of the Pacific. Front and back views. David Hunwick was born in England and grew up in the verdant countryside of Kent. He attended Ravensbourne College to study sculpture and was selected for the New Contemporaries Exhibition in Manchester. 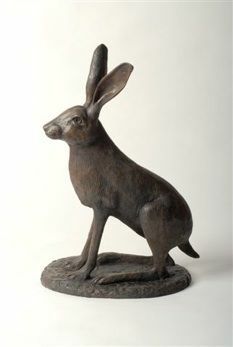 While an Artist-in Residence in Stirling, Scotland, the sculptor exhibited at the Royal Scottish Academy in Edinburgh. Since emigrating to Canada with his wife and two sons in 2001, David has worked on public, private and commercial projects. He founded The Sculpture Studio in 2008. His artwork is collected worldwide. 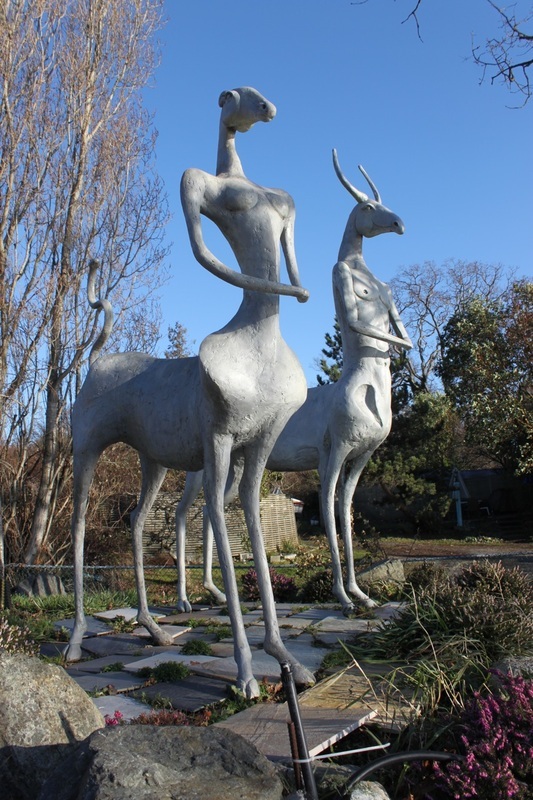 Adam and Eve by David Hunwick, steel and resin with patina, 2009. The first Adam and Eve sculpture was completed in 1986 and installed in the Yorkshire Sculpture Park. Adam and Eve (1986) are now on permanent display at Woolley Hall College in Yorkshire. David’s ideas for narrative-based sculpture come from mythology and the natural world. Adam and Eve depict the fall from grace with an elegant simplicity of form. “There is both grandeur and a sense of lost dignity in the exposed centaur shapes,” says the sculptor. Inspiration for Adam and Eve came from Henry Moore’s King and Queen. Egyptian and Etruscan sculpture impress David as well as the tall thin figures of Giacometti. Line, movement, rhythm and texture are important elements in his work, plus the visual drama of negative space. Michael deRoos, B.Sc. and partner Michiru Main, M.Sc. in front of completed Blue Whale Project. “David’s technical skills were essential for the moulding and casting of rib bones and reconstruction of the skull,” says Michael. The project took two years and involved casting 31 ribs, from three to nine feet long. Light weight replicas of the original bones were needed to successfully suspend the 26 metre Blue Whale skeleton. David was enthused about the project, explains Michael, and was open to experimenting and brainstorming solutions along the way. He understood and accommodated my needs about reconstruction details, and his work on the damaged skull was excellent. David hired and trained a technical team to assist with the heavy workload. Jane and Peter Ellman, owners of Muse Winery and Bistro Muse, stand with David Hunwick’s Adam. Muse Winery is located in the rolling hills of North Saanich near the sparkling waters of Deep Cove. When people visit, explain the owners, they often comment on the European feel of the estate. In the Spring of 2010, David organized a group show of The Imagists at Muse, then taught sculpting classes at the winery over the summer. Some of David’s sculptures remained on the terrace. David’s bronze mermaid plaque on the Muse sign adds old world charm to the entrance way. Jane and Peter praise David’s calm and professional manner. “He’s quite thoughtful in both speech and actions,” says Peter. Forbidden Fruit by David Hunwick. The two geologists, who operate Tekhne Research Inc., saw a photo of David’s 1986 Adam and Eve sculpture. Intrigued by the interesting characters and dramatic scale, they arranged a similar commission. 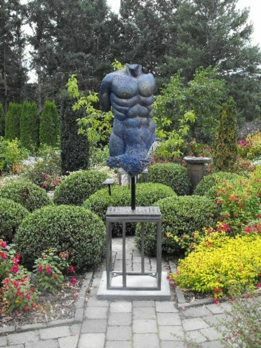 After many discussions about medium, size, volume, placement and patina, the sculpture was delivered in January, 2010. Melanie Furtado (right) studied clay figure modeling, moulding and casting with David. The former student says: “I learned a lot of technical skills from David. He’s quite open to experimenting with different mediums and methods.” Melanie praises the friendly atmosphere and sense of community at The Sculpture Studio. Melanie now has her own studio space downtown: #2002 - 1818 Government St (near Herald) for classes and exhibitions. Mark Heine is an established artist from a famous family of painters. His artwork graced The Winter Show at The Sculpture Studio (2012). Mark first viewed David’s sculpture at the Sooke Fine Art Show. “I was intrigued by his unique treatment of the female form,” recalls Mark. Moody Blue by David Hunwick, cast portland cement and steel, 2010. Sculpture Garden at the Horticulture Centre of the Pacific. Silent Memories, resin and steel, 2011. David working on a 26 metre Blue Whale skeleton. or tel : 250 419 3233. The Sculpture Studio can be located at: 211 Harbour Road, Victoria, BC V9A 3S2.